I am very excited about the prospect of making some positive environmental changes at work. Chris’s story and his achievements give me the hope that I and the team of like minded coworkers who have joined me can make a difference both for the environment and for the company’s bottom line. I am starting from scratch; I have put together a team under the aegis of the Employee Activity Committee to make April “Earth Month” at our research and development facility. This is the first Earth Day celebration we will be participating in as a facility. We'll be screening this movie and "Who Killed the Electric Car?" as part of an effort to increase awareness. costs from operations at our facility. employees, but for the surrounding community. some to the local food bank and allowing the employees to keep the rest). - Making green roofs, installing solar panels or some other friendly use of the buildings on site. 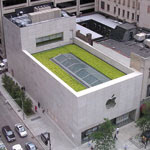 The Apple Store in downtown Chicago has a green roof; this might make a good model for our R&D facility. I am looking forward to this endeavor; I know the corporation as a whole is focused on becoming more environmentally friendly. Last year we converted our sales force company car options to hybrids, we donate water purification systems to the areas where we have production facilities and many of our production facilities have won efficiency awards. I have a great team to work with can’t wait to get started. Stay tuned for more reports on this journey.